Hi , today i bring to blog this delicious recipe and simple, yesterday was a day of salad but we stand by soups because we are all with flu, unfortunately = ( I hope you enjoy!!! In a large saucepan, place the warm margarine, oazeite, garlic, bay leaf and chilli. Let it warm all too well. Season the prawns with a little salt and pepper. After all very hot, add the shrimp and keep the high heat until the shrimp become means fried. 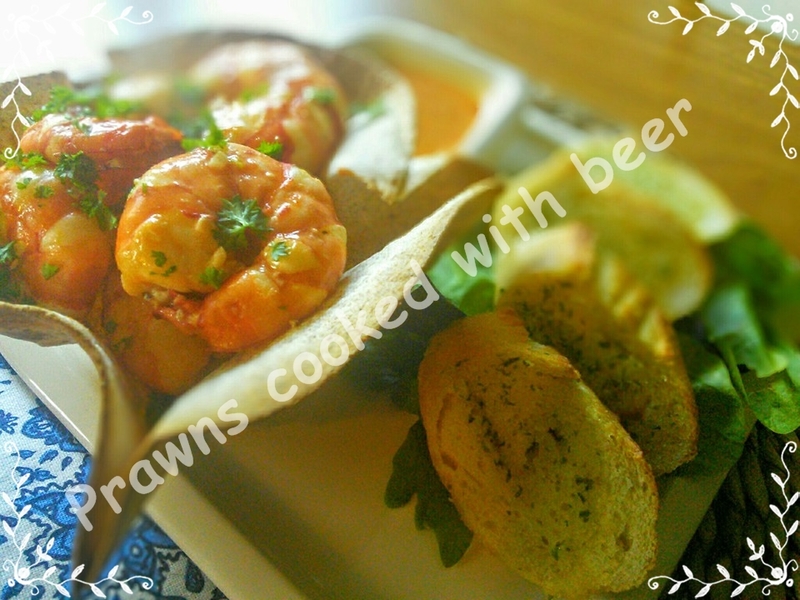 After the prawns gain color, add the beer and keep the fire at most until the shrimps get fried. After cooking, remove the shrimp to a plate with a slotted spoon. Let the sauce determine for 5 minutes. Last 5 minutes turn off the heat and set aside the remaining sauce to serve with the shrimp. Garnish with an edible basket and serve with garlic bread and a sheet base (I used spinach, rucla, watercress). Sprinkle shrimp with fresh parsley and serve.